Battery recycling is the process of recycling used batteries from various sources, preventing them from going into municipal wastes and landfills for disposal. Almost all household batteries, battery packs from mobile phones, power tools, laptops & remote control units, and car batteries can be recycled. Batteries comprise several toxic and hazardous metals and heavy metals such as lead, mercury, nickel, and cadmium. These can contaminate soil or underground and surface water resources if they go into landfills. Upon incineration, batteries release these metals into the environment along with the ash formed during the process. Battery recycling prevents the degradation of environment and potential health hazards caused from disposed batteries. Batteries are manufactured from various chemical compositions and materials. Each type of battery has a different process of recycling. As a result, the sorting of batteries based on their chemical composition becomes an important aspect for battery recycling. Batteries can potentially pose threat to the environment and human health. Raw materials used in the manufacture of batteries such as mercury, lead, nickel, and cadmium pose high threat to human life and environment. Improper disposal of used batteries into landfills can leach these heavy metals to soil, contaminating not only underground water and surface water sources but also causing soil contamination. The battery manufacturing industry has identified these potential environmental hazards caused by improper disposal and has taken initiatives to recycle used batteries. Several nonprofit and government organizations have also taken steps to increase awareness about harmful effects of unsafe battery disposal and benefits of battery recycling. They have collaborated with several automotive companies and service providers for the same. Thus, increase in environmental concerns is expected to be a key driver of the market. The commercial value of raw materials used for manufacturing batteries is high. These raw materials are non-renewable and can be recycled indefinite number of times. Materials obtained from the battery recycling process such as lead, zinc, cadmium, steel, carbon, and plastic can again be used as raw materials in the battery manufacturing process. Thus, battery recycling can reduce the mining of valuable and non-renewable metals, and heavy metals and can prevent them from becoming scarce. Materials obtained from battery recycling are also economical compared to their fresh counterparts. Using these can make manufacturing processes more economical and environment friendly. Increase in demand for portable electronics such as laptops, smartphones, tablets, and digital cameras is also expected to drive the battery recycling market due to the rise in demand for batteries in these electronic products. These products depend on batteries for power supply. Increase in usage of these products is anticipated to eventually boost the usage of batteries. Portable electronics products have a lifecycle of around two to five years. Thus, batteries used in these products are rendered unusable after the expiry of the lifecycle of these products. This is estimated to create significant demand for battery recycling in the near future. Currently, battery recycling is largely carried out at industrial and commercial level. Just a few small scale consumers know about battery recycling. Awareness about battery recycling at the individual level is low; as a result, end-users of these batteries dispose them into garbage dumps instead of giving them to recyclers. This causes pollution in the environment along with various other hazards. Disposal of these batteries in garbage dumps also hampers the recycling process due to the difficulty faced in sorting of these batteries. Thus, low awareness among end-users is projected to restrain the battery recycling market in the next few years. Lead-acid batteries are the most recycled batteries due to the hazardous nature of lead. These batteries have achieved around 99% of recycling rate in North America and more than 90% recycling rate across the globe. Lead is a highly recycled material. It can be recycled infinite number of times. The extracted lead from battery recycling process is reused as a raw material in the manufacture of batteries or other products. Secondary lead production i.e. recycled lead production, is the major source of lead metal production across the globe. Furthermore, usage of secondary lead prevents the exposure of the hazardous metal into the environment. Based on region, the battery recycling market can be divided into North America, Latin America, Europe, Asia Pacific, and Middle East & Africa. Europe dominated the global battery recycling market in 2017. This can be primarily ascribed to the implementation of strict environmental regulations regarding battery disposal and recycling across the region. 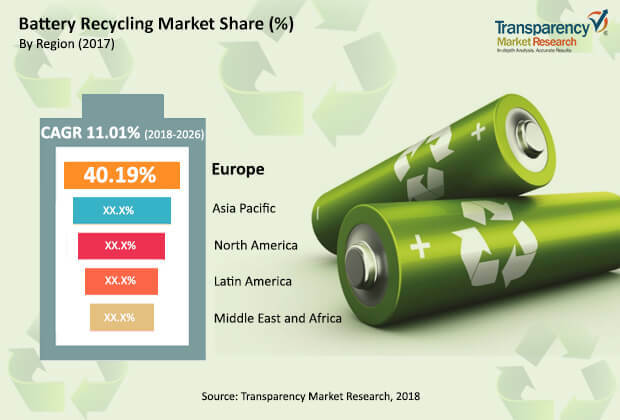 However, the market in Asia Pacific is anticipated to expand at a significant pace during the forecast period, primarily due to the increase in demand for batteries in developing countries and rise awareness about battery recycling in the region. Key players operating in the global battery recycling market are Battery Solutions LLC, Call2Recycle, Inc., Exide Technologies, Retriev Technologies, Inc., East Penn Manufacturing Company, EnerSys, G & P Batteries, Gravita India Ltd., Johnson Controls, Inc., and Umicore N.V.